5Pcs Car 6mm Thickness PE&Aluminum Sound Deadener Heat Insulation Sheets 30 50cm. 5Pcs (50 30cm,Thickness: 6mm). High noise reduction & thermal insulation properties. High thermal & acoustic properties. 12pcs 10mm Thickness Car Sound Mat Proofing Deadener Heat Noise Insulation Deadening Mat Hood Closed Cell Foam 50 30cm. ● High noise reduction & thermal insulation properties. Sound deadening and thermal insulation foam for use within vehicle interior and exterior. 10MM automotive firewall soundproofing Mat PE self-adhesive thermal insulation foam 1x1.4m. 5, You can also use on car roof floors, hood, firewall, chassis, trunk room, trunk lid and so on. Do not cover the chassis wiring or air holes. These stainless steel radiator hose kits are designed to replace your standard rubber radiator hoses. These can be used for Upper Radiator Hose or Lower Radiator Hose. Cut to length. Plenty enough hose to do either the upper or lower radiator hose. 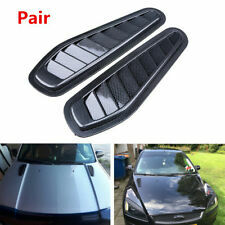 Universal Car Hood Vent Louver Air Cooling Panel Trim Decoration Set Black ABS 2Pcs. Universal Hood Louvers Panels can give you a customized appearance on the outside. Help remove unwanted heat from under your hood. New Audjustable 2pcs Car Autos Racing Bonnet Hood Pin Lock Appearance Kit Black. 2 HOOD PIN APPEARANCE (THEY WILL NOT PROVIDE ANY SAFETY OR LOCKING FEATURES). Interchange Part Number: RACE ALUMINUM JDM FIT ROUND SET AERO LANYARD Other Part Number: LOOK STYLE STICKER STICK ON SAFETY LOCK PINS LATCH. Red Car Hood Vent Spacer Riser Kits For Engine Motor Swap Fit Ford Chevy Nissan. Constructed From Aircraft Grade 6061 Hard Anodized Billet Aluminum. 4 Hood Spacers. Add That Finishing Touch To Your Engine Bay Adding An Agressive Look!